We have all heard in home sales that “The most important view is what can be seen from the street”—that’s called curb appeal. We have found that there’s another important view that exists within the “pool cage” or “beyond” the pool cage. This area has the greatest potential for untapped opportunities. 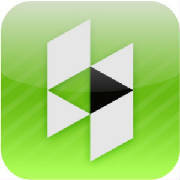 It is often overlooked in home sales, renovations, and buying for added value renovations. By extending the outdoor living space beyond the pool cage, the outdoor space can often flow more outward, from the interior theme to the outdoors extending the living space—connecting the interior to the ‘out of doors’ living areas and beyond the exterior. To extend the spaces beyond the immediate exterior we need to consider whether a larger lawn area, a beautiful fairway or putting green exists, a natural or manmade water body or just a pretty view needs to be considered. Connecting these areas for a broader landscape offers unlimited possibilities to visually enlarging an outdoor living space for a more harmoniously “connected” home with abundant spacial opportunities. Screens can sometimes create a disconnect to these spaces if not designed appropriately, or may be too restrictive in their structure type. With careful evaluation of each home we can determine if the removal of a screened cage will enhance the home’s outdoor living space and optimize any views; in some designs this “un-caging” can create wonderful experiences with new found freedoms by connecting a home’s interior to the exterior and beyond—extending the visual surroundings in a vivid way. In this project we felt the design element of the frame’s vertical braces forced the eye to abruptly adjust from one view to another and limited the horizon view of the waterfront. 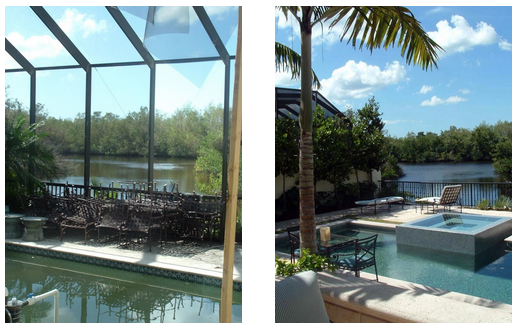 Often times when space is limited beyond the pool, such as in this project, we suggest extending the view past the pool to the absolutely magnificent waterfront coveted by Floridians. By removing the pool cage and adding a new infinity-edge spa, we achieved the illusion of a much larger space for a ‘zen like’ mental freedom. The spa acts as a quiet pool and adds a touch of ‘seamless’ resort – providing tranquility within the newly found expanded outdoor living space with a luxury waterfront view. In this project the cage’s vertical braces and low height clearance made the space feel claustrophobic and confining, forcing the eye to abruptly stop at the caged edges. By removing the older home’s existing cage we were able to utilize untapped square footage within the outdoor living space for the greatest outdoor use — increasing the home’s overall value. 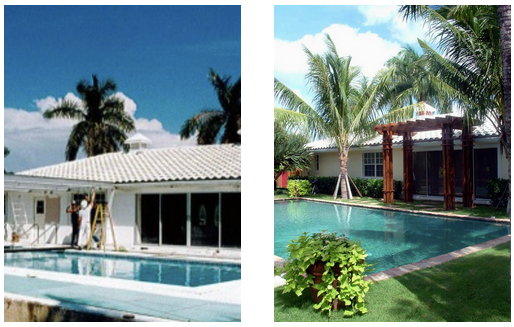 On this particular project, we were able to introduce a lawn around the pool creating more green space. We also introduced a somewhat rustic stone pool coping (which was not possible with a pool cage) to create a much softer, ‘cooling’ and relaxed look by bringing turf up to the edge of the pool. This reinforced the small cottage feel to match the existing home’s architecture. In eliminating the screen, we now had increased paving area that we redesigned as turf that now acts as an informal terrace, which allows our homeowners to entertain in a much larger outdoors area connecting to the raised deck area. Looking at it from a new point of view, we took time in the design phase to look at the home from all perspectives. With landscape design, all views are equally important. In this project, the view from the back corner of the lot to the back of the house and vice versa were equally considered. By adding a statement piece at the door, we guide the viewer to a more visually aesthetic view of the pool, moving the eye out and up to create the illusion of a much larger space. The clients now have an equally beautiful view from the rear of the lot towards the back of the home. While we agree that it is important to embrace the “curb appeal,” the utility of the back yard offers more outdoor living opportunities if we can redesign use beyond the pool cage for increased home value. Many of our clients prefer pool cages but many find it unnecessary if used only seasonally, when pests and weather conditions are of little nuisance. In going screen-less, we sometimes need to compensate for the removal of the sunscreen abilities a cage can offer by adding additional details such as shade palm trees, sunbrellas, and in some projects pergola structures. Please contact us at Garden Bleu Landscape Architecture if you are considering uncaging the opportunities for your real estate listing or home improvement at 239-430-9995. © 2019 GardenBleu All Rights Reserved.